After creating your ScholarLMS account, the first task you may want to accomplish is the setup and branding of the LMS and store. While your account does come preconfigured, you may still need want to tweak some custom settings so that it meets your business’ requirements. Basic settings of the LMS and the eCommerce systems and how to match the branding with your business. 1. Account credentials: Once you sign up, you are going to receive an email containing information on how to login to your account at https://scholarlms.com/login. 2. 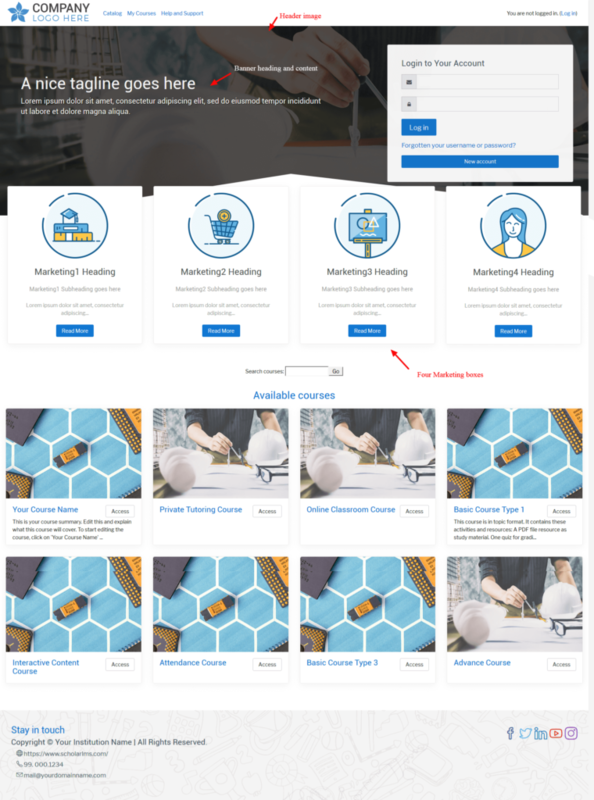 Basic Branding: To have full control on customizing the look and feel of your ScholarLMS account, we provide two platforms LMS and an eCommerce(store) with their own theme settings. Although the basic branding affects both platforms but you can further customize them individually. 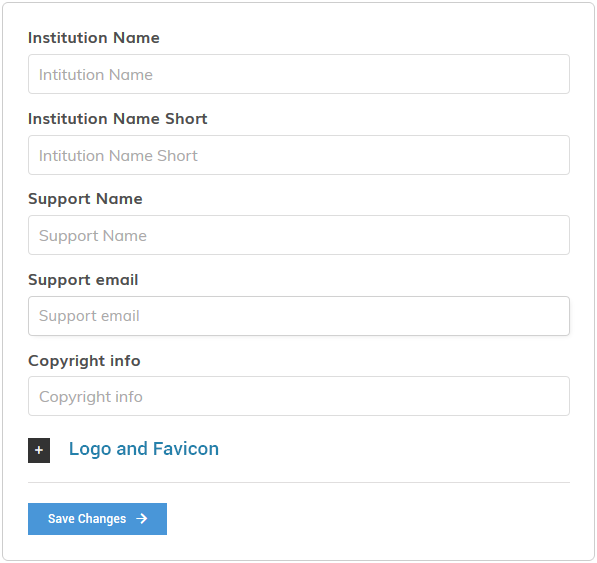 To setup basic branding go to Appearance->Branding, fill in your institutes details, logo and a support email for your students, once you are done, save changes and it will reflect to your LMS and store as well. 3. 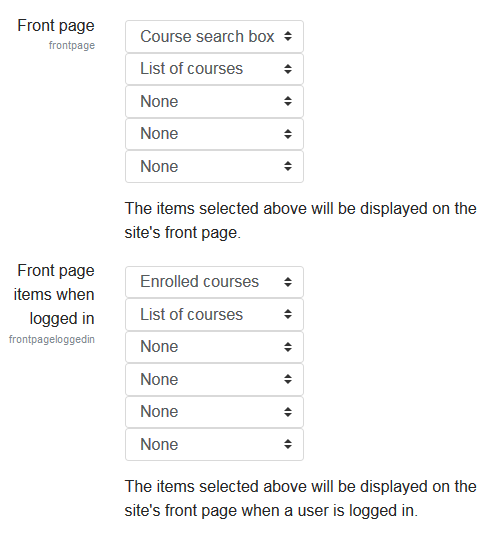 Front page settings: Or the learners’ Home page. It determines what blocks should a logged-in and logged-out users see on their home page. The most important settings are “Front page and Front page items when logged in”, you can leave other options as default for now. Read a detailed article about front page settings. 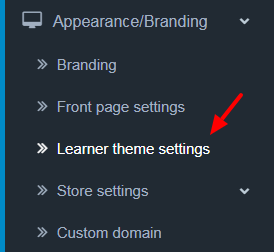 There are several settings to customize your LMS, we will cover each tabs below. If you have setup your logo and favicon icon under Appearance->Branding, this page will automatically pull them. If not, you can also set them up from this page. You can choose one of the pre-existing theme presets which is near to your branding. We built more than 10 color schemes considering several different color variations. Put your brand’s primary color that should overtake from theme preset you just selected. Upload your custom login page image if you want to add to the login page. Image works best if (Image size is be 1500px x 700px). Login page settings: This tab will help you setup a custom headline and content on the login page. Font settings: Setup a custom font for the headlines and content of your LMS site. 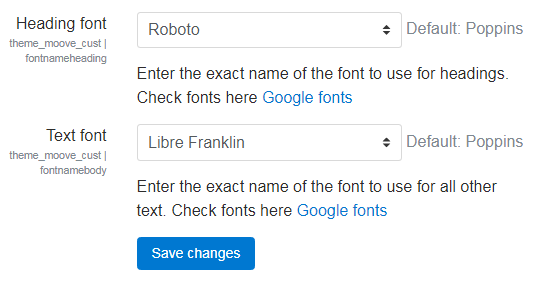 Most of the google fonts are supported and you can choose them from the drop down. Front page settings: From this tab, you will be able to customize the look of home page (landing page) for logged out users. Please refer the screenshot for all the different settings and how it affects the page. More settings: From this tab, you can choose if teacher’s name should be visible under each course, how the courses should viewed (thumbnail view or list view). If you do not see eCommerce options in your account, meaning it’s disabled. You must enable it first before going through this guide. You can enable your eCommerce store from My account page by cliking on the Enable eCommerce button. Store/eCommerce settings: Access Store’s settings under eCommerce->System/settings, you should see your store listed, something like below, now click on the edit icon. And this will take to a new page to edit your store. General: This tab have site settings like name, owner, and address. Local: Change localization settings like country, language, and currency from here. Option: Change more detailed settings for products, reviews, vouchers, taxes, account and checkout. Image: change image related settings for your storefront from this tab. Mail: Setup your email account on this tab. Store layouts: Layouts are like page templates in your store. The default layouts does all the work for you but if you need, you can add new layouts, or edit an existing one. Watch this short tutorial on how to use them, or read this detailed guide. Store banners: Banners are pictures containing linkable images displayed in the store’s store front. Banners can be utilized to catch the customer’s eye and direct them to special products in the store. The Banners page under System>Design>Banners lets you customize the images and links displayed on the banners. Watch this short tutorial on how to configure them. At the time of account creation, the system will create a default sub-domain something like https://example.scholarlms.com with pre-installed SSL security. For setting up the custom domain for your account, go to Appearance->Custom domain page. You should now land on the custom domain setup page, the page will ask what custom domain type you want to setup. You should read the instructions on the page before filling-in details. If you do not understand what information you should put on the form, you should contact your website developer or contact our team to guide you through this setup. Note, even after setting up your custom domain, your account’s ScholarLMS default subdomain https://example.scholarlms.com never changes and is always accessible.